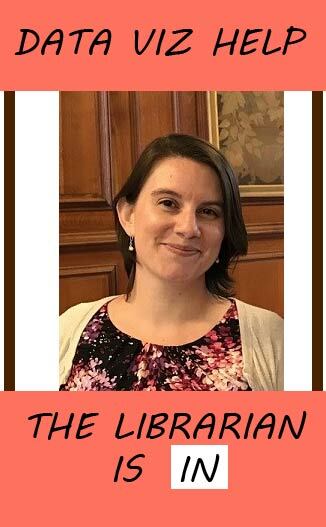 Our amazing Data Visualization Librarian Megan Ozeran is holding open office hours every other Monday for the Spring 2019 semester! Drop by the Scholarly Commons from 2-4 on any of the dates listed below to ask any data viz questions you might have. Office hours on: February 25, March 11, March 25, April 8, April 22, and May 6. Additionally, Megan will teach a joint workshop as part of our Savvy Researcher series titled “Network Analysis in Digital Humanities” on Thursday, March 7th. Megan and SC GA Kayla Abner will cover the basics of how to use NodeXL, Palladio, and Cytoscape to show relationships between concepts in your research. Register online on our Savvy Researcher Calendar! October was one of the busier times of the year, with eight overlapping news stories. 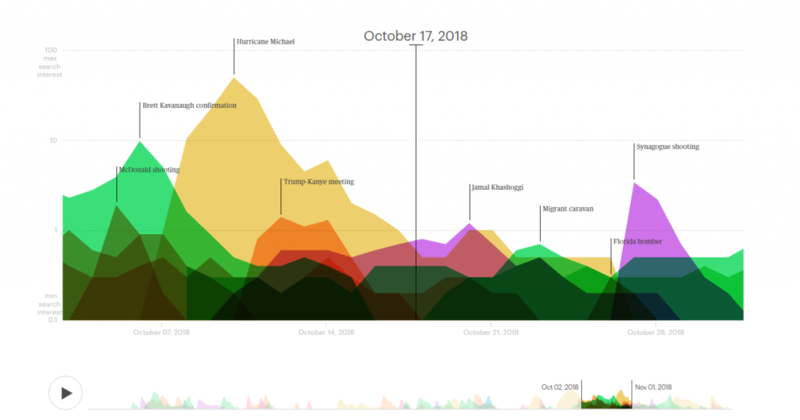 Hurricane Michael tied with Hurricane Florence for the largest number of searches in 2018. According to trends compiled by the news site Axios, “news cycles for some of the biggest moments of 2018 only lasted for a median of 7 days.” Axios put together a timeline of the year which shows the peaks and valleys of 49 of the top news stories from 2018. A simplified view of the year in the article “What captured America’s attention in 2018” shows the distribution of those 49 stories, while a full site, “The Lifespan of News Stories,” shows search interest by region and links to an article from Axios about the event (clever advertising on their part). Knaflic’s icicle-style design for minimum temperature. If there were to be a search interest visualization for the past few weeks in the Midwest, I have no doubt that the highest peak would be for the term “polar vortex.” The weather so far this year has been unusual, thanks to the extreme cold due to the polar vortex we had in the last week of January. Cole Nussbaumer Knaflic from Storytelling with Data used the cold snap as inspiration for the #SWDchallenge this month: visualize variance. 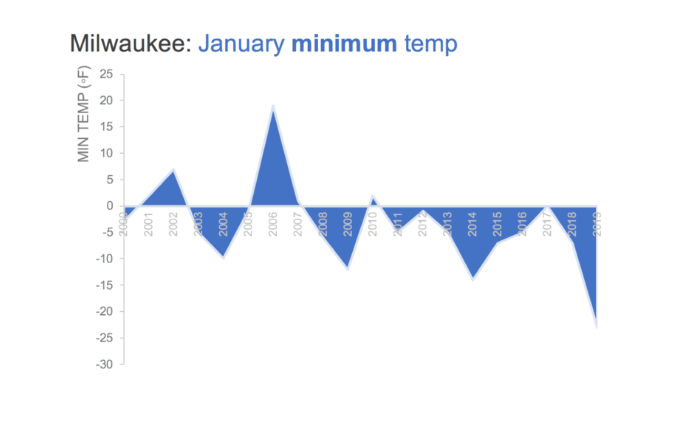 Knaflic went through a series of visualizations in a blog post to show variation in average temperature in Milwaukee. This entry was posted in Data Services, Data Visualization and tagged data, Data Vis, Data Visualization, exploring data visualization by Xena Becker. Bookmark the permalink.